« Short Story or Novel? Wait! That’s how Shakespeare wrote the plays. Although he obviously liked kings named Henry, he skipped the first three. Did they actually exist? JANE: I do, too! Consider “Henries” official Tangent-speak. ALAN: Let’s start with William the Conqueror. He died of peritonitis in 1087. His corpse was more than a little ripe and actually exploded at his funeral. His son William Rufus succeeded him. JANE: Wait! Back up… I thought we were talking about Henries, not exploding Williams. Or non-exploding Williams, unless William Rufus made it a tradition. ALAN: Oh we are talking about Henries – William Rufus was a very unpopular king. He died in a “hunting accident” in 1100 after being shot with an arrow. I’ve put rabbit ears around that phrase because many people feel that it was no accident at all, but rather an assassination, which may well have been organised by his younger brother, Henry. Certainly Henry (who was definitely present when William was shot) was crowned within days of the event and he ruled as Henry I for the next 35 years. JANE: This sounds like something from a novel… In fact, I think I put something like it in the Firekeeper Saga. Go on… Now I see the Henry in the offing. JANE: Was it “Matilda”? I seem to remember “Maud.” Empress Maud. ALAN: Yes, it was Matilda. And yes, it was Maud. They are both variations on the same name; Matilda is the Latin form of the Saxon name Maud, and was usually used in official documents, probably because it looks (and sounds) rather more regal. JANE: Wonderful! I really like that. Now, I am going to surprise you. I know about this particular civil war because it provides the backstory for Ellis Peters’ “Brother Cadfael” stories. In the novels, she is referred to as Empress Maud. Are you familiar with these stories? ALAN: I’ve read one or two of the books and quite enjoyed them. In the late 1990s, a TV series was produced in England. Derek Jacobi played Brother Cadfael and made a magnificent job of it. JANE: I’ve also heard good things about the dramatizations, though I haven’t seen them. One thing I really liked about the novels was that neither Empress Maud or King Stephen are presented as the “good guy” in the struggle. Cadfael and his friends favor Stephen, but Stephen’s weaknesses as a ruler and commander come out time and again. It made for a much stronger story. Just making sure we don’t have a typo here… Did you say that both Henry I and Henry II reigned for 35 years? ALAN: Yes indeed – I find it an amusing coincidence that the first two Henries both held the throne for exactly the same length of time. JANE: Delving into my admittedly flawed memory of which Henry was which… Wasn’t Henry II the king who appointed his hunting, shooting, sporting buddy Thomas Becket to be archbishop – with rather unpleasant consequences for both of them? ALAN: Yes, indeed. Henry appointed his friend Becket to be Archbishop of Canterbury. He hoped that their friendship would give him more control over the Church. However, rather to his surprise, Becket proved to be a staunch supporter of the Church’s policies and he repudiated his friendship with the king. Four of his knights took this to heart and travelled to Canterbury to confront Becket, convinced that they were carrying out the king’s will. Becket was hacked to death. Henry took no action against the killers, which suggests that he might well have set the wheels in motion deliberately. JANE: Given Shakespeare’s fondness for writing plays about kings named Henry, it’s rather a surprise that he didn’t write a play about this. It has all the elements of good drama. ALAN: Yes – we had to wait until the twentieth century before the story got the treatment it deserved when T. S. Eliot wrote Murder in the Cathedral. JANE: Perhaps the reason Shakespeare chose not to deal with the story of Henry II and Thomas Becket is that the question of whether to be loyal to your monarch or your church was a little too much of a “hot button” issue at the time. ALAN: That’s probably true – Shakespeare’s contemporary Christopher Marlowe was accused of heresy and was killed under mysterious circumstances that might well have been a governmental assassination. Sometimes being a playwright could be a dangerous profession! 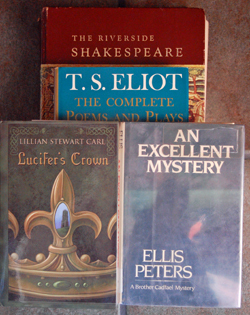 Going back to your earlier comment, Murder in the Cathedral is an excellent play, Eliot’s best, in my opinion. There are a couple of lines in the scene that ends Part One (right before the interlude) that always ring in my heart. In choosing to follow not only his duty but his principles, and finally to forsake the temptation of pride, Eliot’s version of Thomas Becket becomes, for me, one of the greatest heroes of fiction – a hero in the old sense, not in the modern sense, which often means nothing more than “protagonist.” I remember a lovely panel of the subject, with Jo Walton and Steve (S.M.) Stirling, at a long-ago World Fantasy Convention that ended with me learning about an interesting take on the subject. Will you permit me to tangent? ALAN: Please do. Isn’t that the whole point? JANE: There’s a novel titled Lucifer’s Crown by Lillian Stewart Carl that gives an interesting twist to the story of Thomas Becket, intertwining it with the quest for the Holy Grail, and a few other interesting motifs. It’s quite good, one of those books that starts light and moves into greater depth. I recommend it. JANE: We’ve made it all the way to Henry II. What about Henry III? This entry was posted on September 26, 2013 at 1:00 am and is filed under Thursday Tangents. You can follow any responses to this entry through the RSS 2.0 feed. You can leave a response, or trackback from your own site. For an interesting look at Marlowe, see John M Ford’s excellent The Scholars of Night, which is really more of a techno-thriller than SF/F, but being by Ford is still superb. And hey, how many novels include both a lost Christopher Marlowe manuscript and Exocet missiles? This sounds great. I’ve enjoyed those of John M. Ford’s novels I’ve read, but I a woefully behind. Also, the Brother Cadfael TV versions are excellent- renting or downloading the DVD’s is well worth it.